Comment on facebook 10 May 2014 and he told me the same by telephone. It is clear a full watershed wide study must be completed before any decisions can be made. 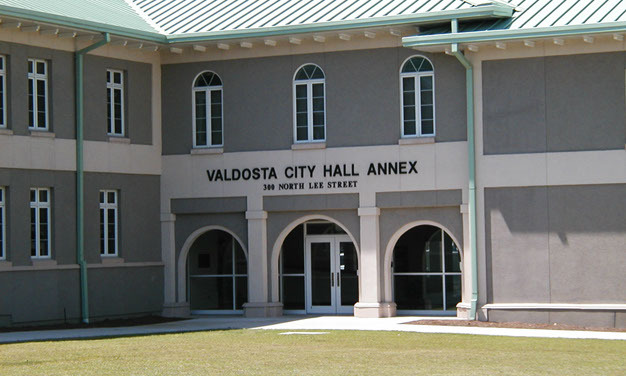 As established in this first study—The City of Valdosta is the recipient-not the origin- of the flood waters. While it confirms what we already knew, my job is to try and keep the ball rolling forward. Engage congressional leaders, secure funding and find long term, sustainable solutions that benefit all communities within the watershed basin. A levee by itself is not the answer. This entry was posted in Government, Planning, Valdosta City Council, Water, Weather and tagged 6 May 2014, conservation, flooding, Georgia, Government, Gretchen Quarterman, LAKE, Lowndes Area Knowledge Exchange, Lowndes County, north Florida, Planning, Quantity, River, south Georgia, Suwannee River, Tim Carroll, U.S. Army Corps of Engineers, USACE, USACE Flooding Study, Valdosta, Valdosta City Council, Water, watershed, Weather, Withlacoochee River, Work Session, WWALS, WWALS Watershed Coalition on May 16, 2014 by John S. Quarterman. To the VDT the county government always smells like azaleas and the city of Valdosta government always smells like sewage. The local newspaper of record doesn’t seem to smell sewage or landfill problems from Lowndes County. Today’s VDT editorial complains about environmental groups paying attention to “theoretical disasters” (presumably referring to the Sabal Trail pipeline), yet the VDT has never covered the group that has most consistently followed the watershed-wide flooding issues that cause Valdosta’s flooding problems: WWALS Watershed Coalition. The VDT recommends citizens get more involved in sniffing out Valdosta’s sewage problems, yet it doesn’t seem to cover Citizens Wishing To Be Heard anymore, nor has the VDT called for the citizen participation sessions promised by the local governments for the Army Corps of Engineers flooding studies. Maybe the VDT could encourage citizen participation, rather than ignore it. 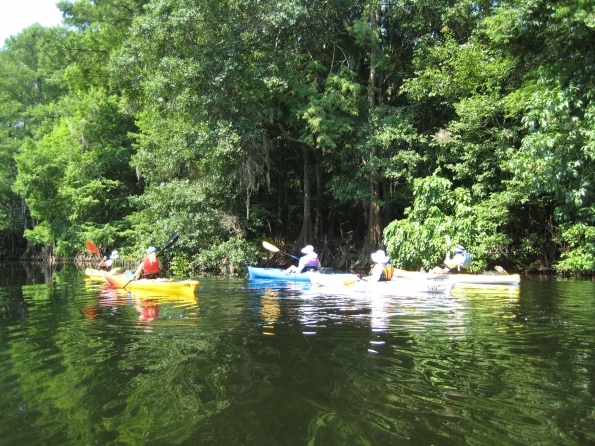 This entry was posted in Biomass, Coal, Environment, Health Care, Incarceration, Natural gas, Pipeline, Transparency, VDT, Water, WCTV and tagged Biomass, Coal, Environment, flooding, Georgia, Health Care, Incarceration, LAKE, landfill, Lowndes Area Knowledge Exchange, Lowndes County, natural gas, pipeline, Sabal Trail Transmission, sewage, SpectraBusters, Transparency, USACE, Valdosta, VDT, waste, Water, WCTV, WWALS, WWALS Watershed Coalition on April 13, 2014 by John S. Quarterman. Flood control to keep water out of houses seems like a good idea, but it turns out that it causes the flood control measures to keep needing to be raised higher, and it encourages people to build too close to flooding areas, plus “rare and catastrophic events take place”. 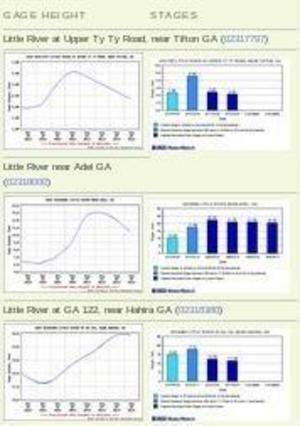 Like the 2009 “700 year flood” and the four or more floods this year that have overflowed the Withlacoochee Wastewater Treatment Plant. In our case, there are also the issues of widespread clearcutting and buildings and streets with impervious cover. The local runoff containment requirements in the various local government zoning codes may be like levees: “flood control structures might even increase flood risk as protection from frequent flooding reduces perceptions of risk”. This encourages human settlements in floodplain areas, which are then vulnerable to high-consequence and low-probability events. Much simpler just not to give out building permits for flood zones. Or we could put medical buildings right next to a creek, assuming because it’s never flooded it never will…. Socio-hydrology: conceptualising human-flood interactions, G. Di Baldassarre, A. Viglione, G. Carr, L. Kuil, J. L. Salinas, and G. Bloschl, Hydrol. Earth Syst. Sci., 17, 3295–3303, 2013 doi:10.5194/hess-17-3295-2013, © Author(s) 2013. CC Attribution 3.0 License. This entry was posted in GLPC, Government, Planning, Pollution, Safety, Science, Transparency, Valdosta City Council, Water and tagged 2013, 5 September 2013, flooding, GA EPD, Georgia, GLPC, Government, Greater Lowndes Planning Commission, Gretchen Quarterman, LAKE, Lowndes Area Knowledge Exchange, Lowndes County, One Mile Branch, Planning, Pollution, population, Regular Session, Safety, sidewalk, stream buffer, Transparency, Two Mile Branch, Valdosta, Valdosta City Council, variance, Water, Withlacoochee River, Withlacoochee Wastewater Treatment Plant, WWTP, zoning on September 7 on September 8, 2013 by John S. Quarterman. 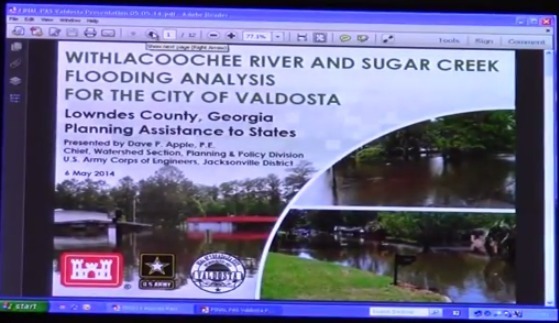 Fourth or fifth flooding at Valdosta’s Withlacoochee Wastewater plant this year? So many I’ve lost track; somebody help me…. Due to continued heavy rains in Valdosta and surrounding areas in recent days, moderate flooding of the Little and Withlacoochee Rivers caused a hydraulic overload at the Withlacoochee Wastewater Treatment Plant. As a result of a peak hourly flow of 15.58 million gallons, the incident led to a discharge of total suspended solids in excess of the National Pollutant Discharge Elimination System (NPDES) permit limit. This entry was posted in Pollution, Safety, Transparency, Water and tagged flooding, GA EPD, Georgia, LAKE, Lowndes Area Knowledge Exchange, Lowndes County, Pollution, Safety, Transparency, Valdosta, Water, Withlacoochee River, Withlacoochee Wastewater Treatment Plant, WWTP on August 25, 2013 by John S. Quarterman. This entry was posted in Economy, Government, Transparency, VLCIA, VLCIA 2013-04-16, Water and tagged 16 April 2013, Alapaha River, Allan Ricketts, Andrea Schruijer, arsenic, Attorney, Chairman, CPA, Economy, Executive Director, flooding, Georgia, Government, J. Stephen Gupton, Janet McMahan, Jerry Jennett, John S. Quarterman, LAKE, Little River, Lowndes Area Knowledge Exchange, Lowndes County, Lu Williams, Mary Gooding, Norman Bennett, Operations Manager, outings, Project Manager, Public Relations & Marketing Manager, Regular Meeting, Roy Copeland, S. Meghan Duke, Tom Call, Tom Davis, Transparency, Valdosta, Valdosta-Lowndes County Industrial Authority, VLCIA, VLCIA 2013-04-16, Water, Willacoochee River, Withlacoochee River on April 24, 2013 by John S. Quarterman. The Industrial Authority was very forthcoming about everything about their new office purchase except who they were buying it from; this was at the 16 April 2013 Board Meeting of the Valdosta-Lowndes County Industrial Authority. The seller turns out to be a household name hereabouts. This entry was posted in Economy, Government, Transparency, VLCIA, VLCIA 2013-04-16, Water and tagged 16 April 2013, Allan Ricketts, Andrea Schruijer, Ashley Paulk, Attorney, Chairman, containment, CPA, Economy, Executive Director, flooding, Georgia, Government, impervious surface, J. Stephen Gupton, Jerry Jennett, John S. Quarterman, LAKE, Lowndes Area Knowledge Exchange, Lowndes County, Lu Williams, Mary Gooding, Norman Bennett, Operations Manager, Pinnacle Prime, Project Manager, Public Relations & Marketing Manager, purchase, Regular Meeting, rent, Roy Copeland, S. Meghan Duke, Tom Call, Tom Davis, Transparency, Valdosta, Valdosta-Lowndes County Industrial Authority, VLCIA, VLCIA 2013-04-16, Water on April 24, 2013 by John S. Quarterman.